hahahhaha I don’t know Rebecca…not sure about that…..at least I wanted to share my plans for the conference with all of you since you are part of my extended family! Mr. Gonzalez, first of all congratulations on this conference and I hope the audience will be educated as much as the brain does, performing your exercises. You should talk more about this in colleges and universities since I believe students will benefit a lot from it. My question is always about the science behind it. I have not seen the slides of your presentation so, how do you know for sure that these exercises emphasize more on the cerebellum rather than other areas of the brain???? I know that cerebelleum is responsible for motor control and coordination and to support this are the research subjects the only one to prove so? Second, this area of the brain is very important for other functions as well, as you may know, so is there any evidence that in the case of damage or degeneration people will experince disorders in motor learning, posture and so on. Have you extended your studies to a group of people that have such disorders due to cerebellum damage? And my final one: Is there any research extended to Purkinje cells and neuronal plasticity done in conjuction with the exercises?? Prove of it should be quite remarkable. Looking forward to hearing from you!! Thanks so much for your inquisitive and always challenging questions. Yes the Cerebellum it is an authentic hidden treasure in our brains. The Cerebellum, like you mention it is responsible for balance, coordination and many other functions such as posture alignment, muscle timing, problem solving speech and others. However one of the functions that have been studied the most and not mentioned yet is that The Cerebellum receives all the sensory propriocetive feedback from our muscles, tendons, ligaments and so on. You mention that the Cerebellum is a “motor control structure” what does it mean? It helps to control our movements. Let me give you an example. Our cardiovascular system includes our heart and all of our arteries and veins. Damage to the heart, a pump, affects the system on a whole. It doesn’t work well, even if our arteries are working just fine. The motor system has many components, located in many different parts of the brain and spinal cord. One component is the cerebellum. It is important in coordination, among other things. The Cerebellum has three different parts. Why are these parts so important? Each part contributes something different to the overall function of the cerebellum and the motor system. One for posture and balance, one for coordinating movements of our arms and legs, and a third for helping us to plan our movements. How different are Purkinje cells in the Cerebellum from the “traditional” neurons in the rest of the brain? I think they are different in several ways. Let me tell you about two. First, they take in an enormous amount of information. Think of a big tree with lots of branches and leaves. This is like a Purkinje cell; the branches and leaves are receiving information from other parts of the nervous system. They have more “branches and leaves” than other nerve cells. Second, they are different in another way; they inhibit the firing of other neurons. Most neurons that receive so much information excite other neurons; Purkinje cells inhibit. We don’t know why this is the case. How important is sensory information when it comes to movement. Movements are adapted to the goals at hand; movements are purposeful. To make movements effective, they are fine-tuned to the environment. For this to happen we need the help of the sensory systems. When we reach for a water bottle, we need to see where it is, precisely. When we step, we need to make sure where the ground is. This occurs because the sensory systems communicate with the motor systems. The cerebellum receives a lot of sensory information, but its job is not just a passive receiver. It needs to figure out what aspects of sensation are important for controlling movements. 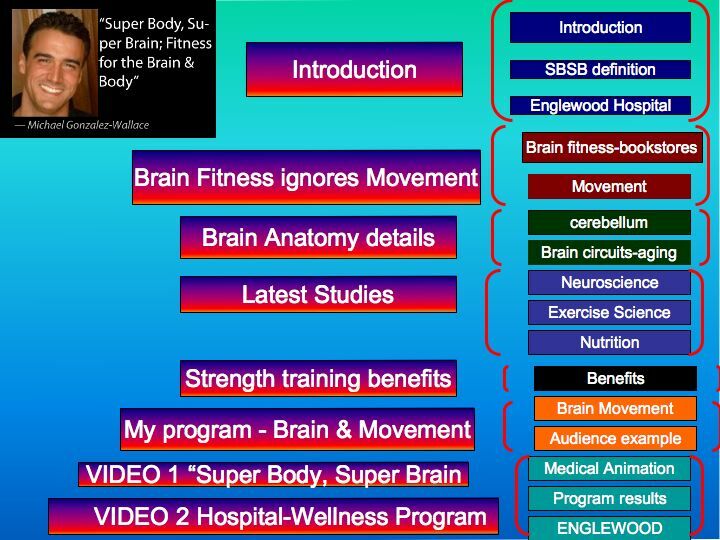 COMPLEX MOVEMENT VS SIMPLE MOVEMENT http://www.budovideos.com/shop/customer/product.php?productid=21392&cat=440&page=1. Now do you want to test your cerebellum? Stand up tall, raise left leg bent up in the air, close both eyes and clap for thirty times, your supporting foot should not be moving at all, isn’t challenging? Well the cerebellum it is not receiving the sensory proprioceptor of your eyes so you are challenging to the other sensory proprioceptors to be working together especially your propprioceptors in ligaments, tendons and muscles with other main muscle groups. In theory do you think that 10 minutes of specific brain exercises a day is a good start? Would synapses strengthen if we were consistent? Time is a hard question to answer. Consistent neural processing of new information over 10 minutes is certainly enough to produce lasting changes in the properties of nerve cells. But this is mostly studied in animals, and in very specialized kinds of experiments. It is hard to extend this, in a quantitative way, to people performing movement tasks. Also, each person is different. Starting from scratch, in a person who has not exercised much, a short time is apt to be more effective than the same short time in someone who has a lot of exercise experience. This is as much as I can say. Can learning new motor coordination patterns stimulate the cerebellum and create new synapses in theory? In theory, yes. The cerebellum is clearly important in learning new coordination patterns. But it is more than just the cerebellum. Many other parts of the motor systems respond to this challenge, especially the cerebral cortex motor centers and the areas of the nervous system that these cortical centers connect, such as the spinal cord. Why is important for human beings to learn new coordination patterns? I think it is just like continuously challenging the cognitive systems. It maintains the circuits for coordination/complex movements and builds new connections. Why it could be especially important for Alzheimer disease? Movements, and complex ones with novel coordination patterns in particular, recruit the entire brain. Not just the motor systems, but cognitive and memory systems as well. Maybe even the emotional systems, when we are pleasure or pain from our actions! For complex movements, we have to plan on the fly. It is very challenging. We need to tune into the proprioceptive capabilities of our sensory systems. Second, this area of the brain is very important for other functions as well, as you may know, so is there any evidence that in the case of damage or degeneration people will experience disorders in motor learning, posture and so on. No, I believe that there is more research to be done but it is clear that combining strength training movements with new coordination and balance patters it could be a positive and reinforcing way to make anyone progress substantially. Having said this, it is extremely important that the program is specifically individualized to the client or patient needs. And my final one: Is there any research extended to Purkinje cells and neuronal plasticity done in conjunction with the exercises?? Prove of it should be quite remarkable. Mice allowed to exercise during the late postnatal period had Purkinje cells with larger dendritic trees and greater numbers of spines than littermates whose physical activity was severly restricted. These changes in Purkinje cells were accompanied by a selective reduction in the thickness of the cerebellar molecular layer. The data provide evidence for cerebellar plasticity during late development and demonstrate that physical activity can modify the development of Purkinje cell dendrites. J Cereb Blood Flow Metab. 1992 Jan;12(1):110-9. Exercise and the brain: angiogenesis in the adult rat cerebellum after vigorous physical activity and motor skill learning. Isaacs KR, Anderson BJ, Alcantara AA, Black JE, Greenough WT. Beckman Institute, University of Illinois, Urbana. * J Cereb Blood Flow Metab 1992 May;12(3):533. Absolutely!…..that would be so great to exchange links with you! Mr Gonzalez. This is first time I am visiting your blog. Very impressive. I will follow this blog. You will find a number of points you are able to do to improve the texture, elasticity and look of your skin. The first 3actions are an essential foundation to flawless skin.No matter how much you pay for expensive moisturizers that promise younger, more healthy smooth skin, if you do not do the 3step cleansing routine (cleanse, tone & moisturize), it is improbable that these products will have any real benefit to the skin on your face. 1. Cleanse – Start your skin careroutine with a facial cleanser, by Mary KayCosmetics. That’s it! No additives that can cause irritation to your skin especially if you have sensitive skin. You are able to use the Mary Kay Cosmetics cleanser by simply wetting your skin to rinse. Remove the cleanser by using a MaryKay® Facial Cleansing Cloths. 2. Tone – Next, using cotton wool and Mary Kay Purifying Freshener to remove the last traces of cleanser and tone the skin. Have you tried Flower Waters? They arevery advantageous to the health of the skin as they are organic and contain anti-bacterial properties which stop bacteria growing which in turn prevents rashes and spots. Some also have astringent properties which close pores, and make the skin more toned. Some very good ones to try are good old water – cold, rosewater (good for mature skin too), orange flower water andnaturalwitch hazel. Avoid toners with alcohol as these will dryout your skin which will skimp on your efforts. 3. Moisturise – This step is critical to wholesome skin. You need to replace lost moisture to the skin and this is best done with Mary Kay Balancing Moisturizer Cream to suit your skin type. The most common are sensitive skin, oily skin, dry skin and combination skin, so look out for these descriptions when purchasing creams. 4. Sun Cream – Stay out of the sun – UV rays induce the skin to age, consequentlyuse a factor that is appropriate for your skin type for optimum sun protection. Mary Kay Sun Care Collection is an exceptional choice. 5. Avoid Free Radicals – What are they? See our write-up on free radicals for further details, but in a nutshell the yare molecules that cause the skin to age and crease. Use Anti-oxidants tocounteract free radicals that age the skin. Vitamin A, C & E are especially useful in addition to coconut and olive oil. A handful of almonds are packed with adequate vitamin E to counteract free radicals. 6. Water – yes, consuming water really does help to get rid of poisons and re-hydrate your skin. Approximately 2 litres per day (8x 250ml glasses). 7. Serums – These are nourishing oils with an ingredient to help transport the oils into the deeper levels of the skin so theyimprove the tone and elasticity. It is best to use the remedy twice a day, once in the morning a few minutes before you moisturise and again before you go to bed so that it can do its work whilst you sleep. Mary Kay Cosmetics TimeWise® Replenishing Serum+C is an excellent choice. 8. Face Mask – Use a Mary Kay TimeWise® Even Complexion Mask as a weekly treatment. 9. Rest – Sleep is one of the best things you are able to do for your skin. These tips ought to not be used as a one off, butincorporated into a regular skin care regimen for best effects. I spent one day building a simple blogs. Could you give me some suggestion?